Program---available at the Deaf Pager Store! whether with a phone or Mobile broadband card. 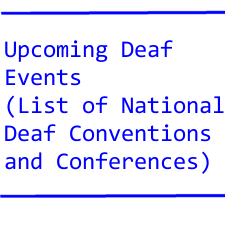 meetings, speeches, etc) accessible to the deaf. VRS relay, Captel and all that thrown in. Certain things don't change in California. 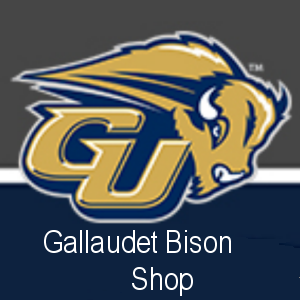 rules, the Bisons was changed to the Bison. has two wall telephones in the lobby. The pay phone has a 711 relay number. The hotel phone is unfriendly to the deaf. to bypass the unfriendly hotel phone! wedding rehearsal party the night before the wedding. it was never with a tip. Such tales that DeafDigest editor never knew about! there were several highway construction zones. or to close up the highway lanes in rotation. not being able to use the walkie-talkie? people that cannot get jobs. and effort, would most likely find employment. A Hearing Aid vs a CI, who wins? to a CI, what to do? in your best ear could produce better results. We had over 600 at the recent silent weekend. language classes for just $89 per person! how to represent inanimate objects is now available. to join us now in 2010 for a Bed and Breakfast tour? What are things that they will not do? Deafness. Exactly what is this? with just two American entries, one in track and other in tennis. reward for Taiwan Deaflympic participants that win a gold medal! needed one more American to make it a team. you have to subscribe to keep up with deafsports in depth! Mountains, invites you to consider our employment opportunities. of the Deaf - Middle School, Language Arts. qualification requirements, under non-classified employment. the New York metropolitan area since 1864. Education Unit  for deaf with multiple disabilities. into the work force or into further training programs. position and by providing appropriate references. Collegiate Education for the Deaf & Hard of Hearing Persons. may be made for compelling reasons. insurance, retirement and related fringe benefits. Application materials must be received on or before October 10, 2009. Program Manager of Maverick Square CBFS program. Indicators through the ISP process and Program Goals. comprehensive and meet agency and funding source standards. maintenance of the house and vehicle. and monitors the program expenses. possessions, within the guidelines of the ISP and agency. 10. Completes all necessary weekly/monthly reports. 11. Implements agency/department policies and procedures. 12. Perform on-call duties as required. BA/BS preferred in human services or equivalent experience. leave days; 10 paid sick days and more. Technology (RIT), a national center of educational excellence. American cities in which to raise a family. The RIT community is diverse, dynamic, and excellence-driven. Rochester Institute of Technology is an EO/AA Employer.